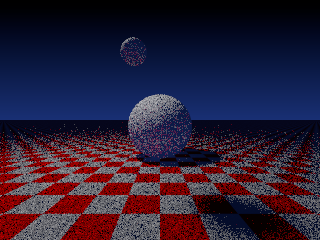 Recently I've implemented Multiple Importance Sampling for the sampling of surfaces in my ray tracer. I do this by, on each intersection, sampling both a random direction from the BRDF and also sampling a random light, then combining both using the power heuristic. It seems that the answer to my question is that my approach inherently can't work. After doing thinking about it some more and researching existing renderers, none seem to implement what I'm doing, and I think the noise comes from contributions from lights other than the one randomly picked will not be estimated with the PDF. To do it correctly I would need to loop through all the lights, which gives me essentially path tracing. Not the answer you're looking for? Browse other questions tagged raytracing importance-sampling or ask your own question.